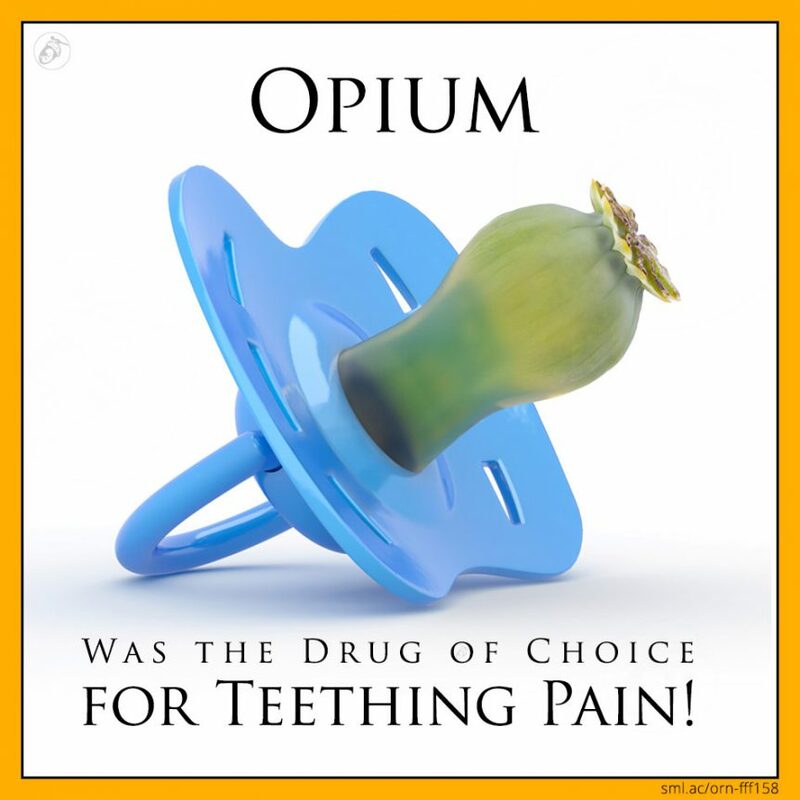 Opium Was the Drug of Choice for Teething Pain! Victorian parents had a prolific choice of unregulated medicines and cures available to them. There were no restrictions to the ingredients or claims that manufacturers could use. 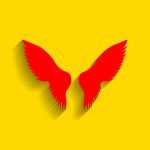 And thus begun the rollercoaster of various drugs used to combat teething that we’re still riding today, with one popular brand being removed from shelves with the past year – we’ll take a look at those, and many others, in the coming weeks. First on the list, and the subject of today’s fact is everything poppy, or more specifically opium poppies. Opium-derived drugs are called opiates and include heroin, morphine and codeine. They were marketed and used to treat teething from perhaps as early as the 1700s. By the mid-1800s, tincture of opium (AKA Laudanum) was commonly available. The market leader of the time was Godfrey’s cordial and was used in epic proportions. Not only was it used for teething, but also by nurses charged with the “caring” of many babies to keep them subdued. It was euphemistically called ‘quietness”. One retailer of the day, in Manchester, was reportedly recorded as selling over six and a half gallons of the stuff in a single week – that’s nearly 30 litres! There are reports from that period of poor working mothers using it to subdue their babies whilst they went off to work – the only way they were able to afford to feed their family. This was demonstrated in a British weekly magazine from 1849, in an illustration entitled “The poor child’s nurse”. In that same year came “Mrs Winslow’s Soothing Syrup” and their slew of advertisements specifically targeting teething babies. From recipe books, trade cards and calendars, their colourful ads were found everywhere. They had bylines such as “The mother’s friend for children teething” and “ A mothers kiss is not half so soothing to baby as Mrs Winslow’s Soothing Syrup” which then continues with “It is absolutely harmless and for over sixty years has proved the best remedy for children while teething”. The thing is, it WAS harmful. It’s main two ingredients were alcohol and the opiate, morphine. As if a good dose of morphine wasn’t good enough, they gave the babies a shot of vodka to boot! We’ll be delving into the use of alcohol for teething next week. By 1894 it was estimated that approximately three-quarters of all deaths caused by opium occurred in children under the age of five. In 1911, the American Medical Association denounced Mrs Winslow’s Soothing Syrup as a “baby killer”. By way of a response, they removed morphine from their formula 4 years later. The UK removed morphine form their recipe slightly ahead of the Americans, in 1909, but continued to sell it until 1930 with its full dose of alcohol. You’d think that would kick opiates out of the teething realm. But, alas, it was still used in its much more dilute form, but similar sounding name, camphored tincture of opium. Camphored tincture of opium was a more dilute version of the popular Laudanum with a few extra ingredients added including; anise oil, benzoic acid, alcohol and the ingredient that gave it its name, camphor. It was widely known as paregoric and was available well into the mid-1900s for teething and is still within living memory of many. Paregoric was available, without prescription, in pharmacies across the united states until 1970. In France, paregoric was also available without prescription until 1986 and is still in use today. Today it is used to help wean infants who are born to opiate-addicted women. 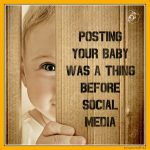 The search to save our little ones from the discomfort of teething pain is still alive and with us. And so is the quest by manufacturers to fulfil this need. Opium for teething pain may seem a bit over the top nowadays, but as soon as it became harder to source, there was a slew of awaiting drugs to replace it. Many you wouldn’t dream of giving to your child, some you may have received when you were teething, and some you may be currently using. In the coming weeks we will be looking at the ones that are no longer deemed acceptable, including teething powders laced with heavy metals, cocaine, and the one drug that may have been given to many of today’s adults when they were teething – alcohol. 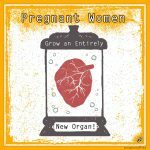 Pregnant Women Grow an Entirely New Organ! 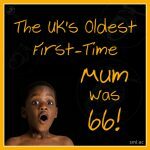 The UK’s Oldest First-Time Mum Was 66! 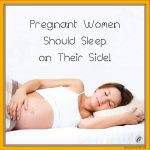 Pregnant Women Should Sleep on Their Side!